Wake up, take breakfast, strike out! It begins with a walk around Terenten to our mills and earth pyramids. An easy, dainty path with many things to see. You will soon get a taste for the scene – and want more! 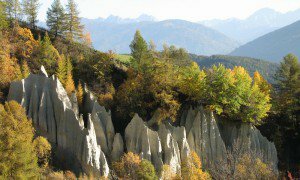 A holiday in Terenten and walking go hand-in-hand. 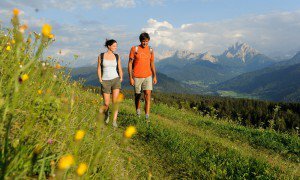 Our walkers’ hotel in Pustertal is ideally situated as a starting place for many routes, or just a short journey away from other places to start. You can start out magnificent panoramic walk or the Mühlenwanderung right by the hotel. Guided hike or going alone? 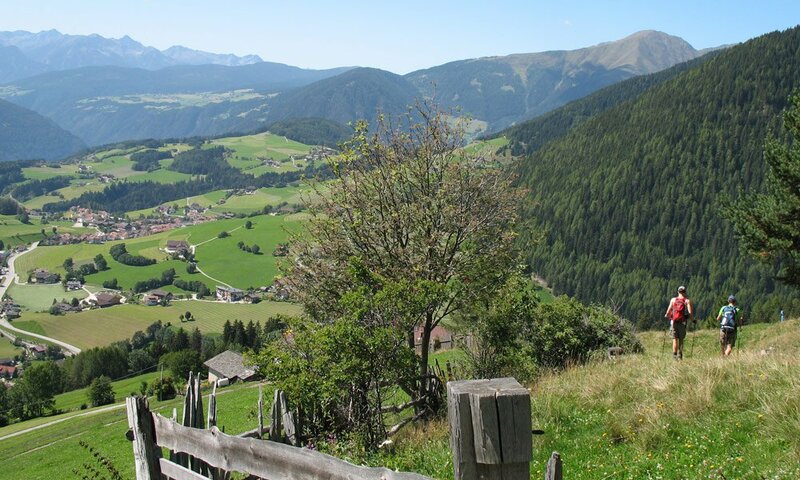 Terenten has many well-signposted walking and hiking paths. They pass through enchanting valleys, through almost untouched meadows and up to considerable mountain peaks of 2,800 metres. The AVS-Tiefrastenhütte and several cultivated meadows offer you a place to rest and recuperate along the way. Guided walks are offered regularly between May and the beginning of October. 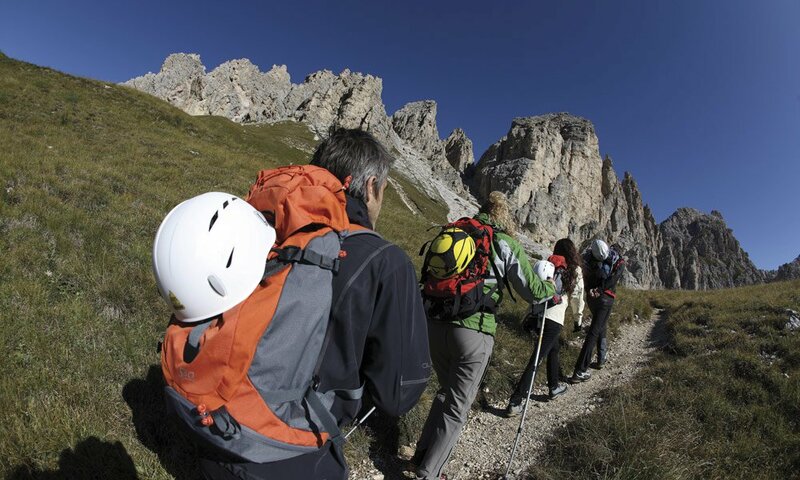 As a walkers’ hotel in Pustertal, we are glad to provide any amount of help and advice. 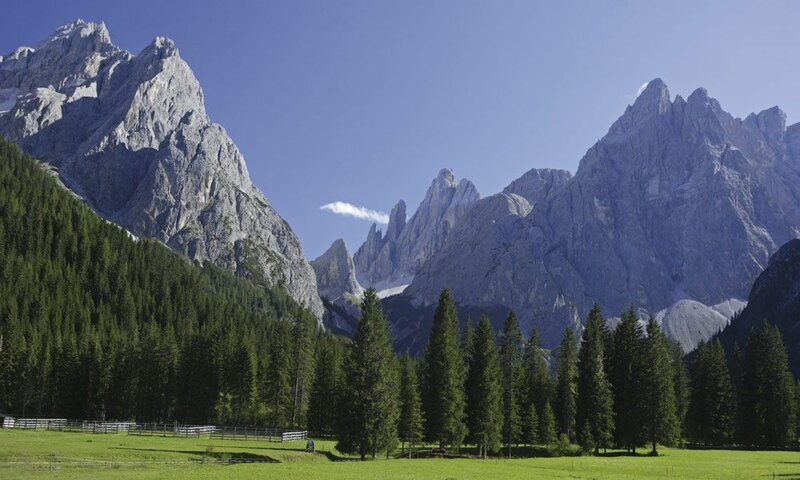 The vast high-alpine plateau of Prato Piazza is located at 2,000 m above sea level with the mountains of the Fanes-Senes-Braies Nature Park in the backdrop. With the car you drive to Brunico and on to Braies. In Braies turn left to “Brückele” and follow the sign-posts to Prato Piazza/Plätzwiese. (From May to September with the payment of a toll fee you can drive up with your own car up until 10 a.m., after that you have to take the shuttle bus from Brückele). From the car park follow path no. 34 to Prato Piazza. The ideal starting point for comfortable hikes for the whole family. From the alpine guesthouse Plätzwiese follow path no. 40 in the direction of Dürrentstein/Picco di Vallandro. Once you reach the summit (2839 m) you enjoy a fantastic view of the Dolomite peaks Neuner (Cima Nove), Zehner (Cima Dieci), Senneser Kar Spitze (Punta Quaira di Sennes), the Three Peaks, and far beyond the Dolomites. 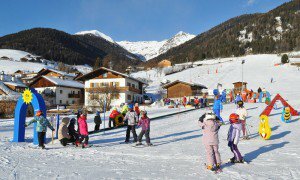 Leave your car at the car park in Brückele and take the shuttle bus up to Prato Piazza. A demanding tour on path no. 3 leads in a westerly direction to Gumpalboden and Croda Rossa past Crodetta (2257 m) and down to Malga Cavallo Hut (2164 m). Descent on path no. 4 to the starting point Brückele. This mountain tour leads through Winnebachtal (Val Vena) valley to Tiefrasten Hut and on to Eidechsspitze Peak (Cima Terento). In order to save your strength for the demanding tour you should drive to the car park in the Winnebachtal Valley (approx. 4 km); then follow the forest path along the river and after about 30 minutes you reach Astnerbergalm Hut at 1641 m. Path no. 23 with some turns leads in the direction of the waterfall and to Tiefrasten Hut. After a short break at the small Tiefrasten Hut at 2026 m you hike through a vast valley basin. Keep to the right and remain on the path (this route section is identical to the High Alpine Fundres Path) until reaching Tiefrasten Hut and the lake. From May to November the hut awaits hikers with tasty traditional food. From here you can hike in the direction of Eidechsspitze Peak on path no. 22 to Campofosso ridge and to Campofosso Lake. Above the lake you see path no. 22 to the right with some steps and serpentines; it finally leads to the highest point in Terento, the cross on the summit of Eidechsspitze Peak at 2738 m.
Important note: Starting from Tiefrasten Hut the tour is suitable only for experienced hikers! From Tiefrasten Hut you can hike up to Kempspitze Peak (2704 m) or to Hochgruppachspitze Peak (2809 m). 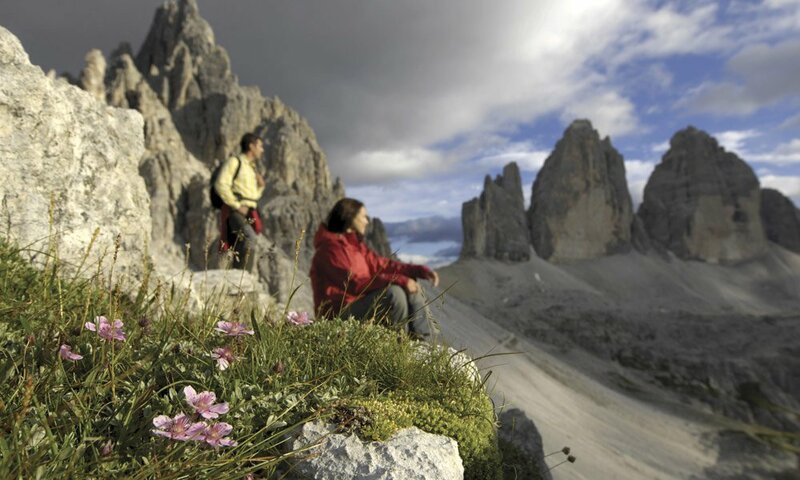 The round tour of the Three Peaks, the most imposing mountains in the Dolomites, is a must for all hikers. With the car you can drive to Auronzo Hut (2320 m), which can be reached through the Landro Valley, and continue in the direction of Misurina Lake – turn left to the car park. (Parking fee). This is where the tour starts! Hike along the southern side of the Three Peaks on path no. 101 in the direction of Lavaredo Hut, from where a path to the left leads to Forcella Lavaredo ridge. Here, at 2454 m you enjoy a wonderful view of the 500 m high northern wall of the Three Peaks. Up to here the path is also suitable for less experienced hikers. On a downhill path you hike along below Monte Paterno until reaching the way fork. Here you can hike in the direction of Three Peaks Hut or directly to “Lange Alpe” and past Lange Alpe Lake. Along the western side of the “Three Peaks” you finally reach the point of departure, Auronzo Hut. 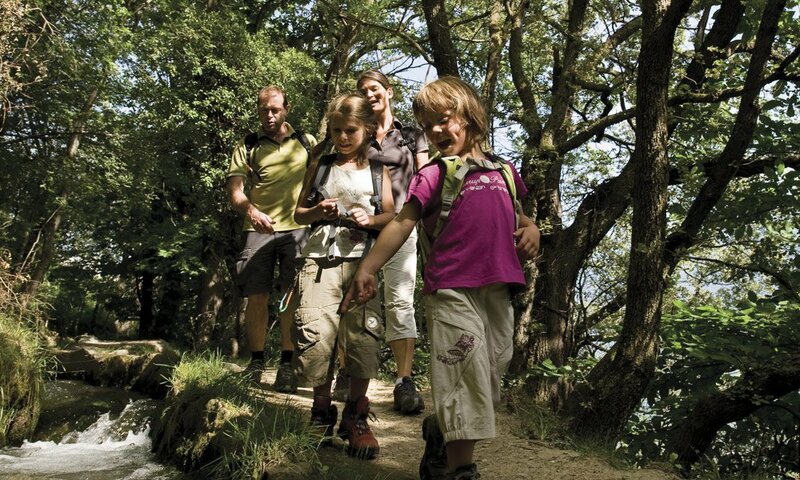 The hike through the enchanting Altafossa Valley is ideal for families with children. 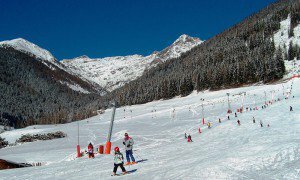 By car you drive to Maranza (about 20 km) and to the car park of Altafossa (parking fee). On a wide forest path you hike into the valley and in the direction of Großberg Hut; at the way fork you take the left path in the direction of Großberg Hut (1638 m) and continue on the round path Altafossa Valley. After about 1.5 hours you reach the beautiful end of the valley with Pranterstadel Hut and Wieser Hut. If you don’t want to take the same route back to the car park you can take path no. 16B in the direction of Wieser Hut, which also leads back to the car park. From Pranterstadel Hut take the narrower path no. 15 in the direction of Großer Seefeldsee lake (2275 m). If you are still up for it you can hike up to the 2724 m high Seefeldspitz Peak. Leaving directly from the hotel you hike in an easterly direction to the Huberhof Farm and on to Alpeggerhof; here you cross the river and take path no. 5 to the Tötscherhof Farm; turn right and hike to Oberpertingerhof and on to the Nunnewieser farm. Continue on path no. 5 until reaching the “Devils’ Stone” and on to Pertinger Alm Hut. The hut is open from May to October. 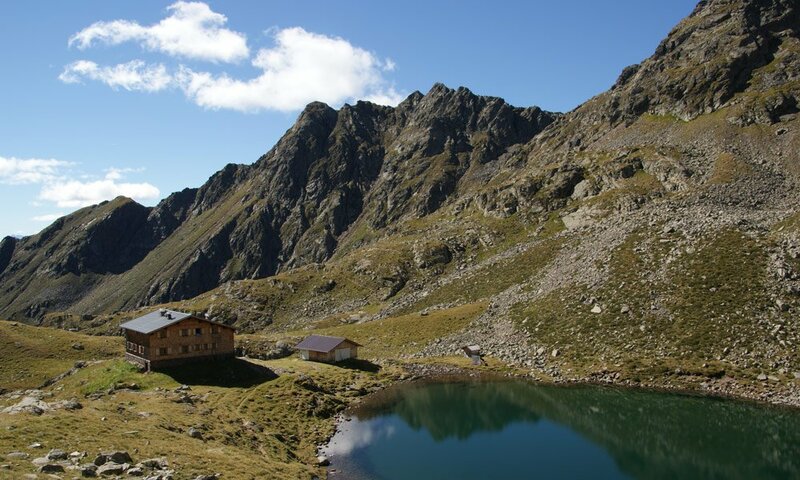 If you are fit again after enjoying a break in the hut you can continue your hike up to the saddle (Joch). Take the car up to the car park past Nunnewieser. From here you can reach the hut in approx. 50 minutes. A comfortable hike for the whole family, which can also be done with a pram. In winter the hut is open from December to March. You can descend with a sleigh. 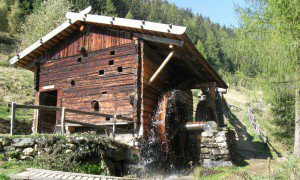 We will drive you up to Nunnewieser from where you can hike up to Pertinger Alm. Then continue on path no. 5 A on the so-called “Gamssteig” to Mair am Hof Hut at 2092 m and on to Huber Hut and to the waterfall; then take path no. 23 leading out of the valley and to Astnerberg Hut, which is open from May to November. Continue in the direction of Gols on path no. 8 and then no. A8 back into the valley and to the hotel. You can turn off at the mills and hike back to the hotel. At the hotel you take the road behind the fire brigade to the river. The Mills Path starts here. Follow the sign-posts. At half way you reach the Jennewein guesthouse and the pyramids. After approximately 10 min. you will get to the 5 main mills. At Hansleitner Mill you can cross the bridge leading to the other side of the river. You hike past an old farm and reach the ski lift. From here a path amidst meadows leads back to the hotel. Above the last mill you follow the marking 8A to Gols. From here path no. 8 leads in an easterly direction to Astnerbergalm Hut. The hut is open from May to November. After a short break you hike out of the valley to Alpeggerhof guesthouse and follow marking no. 1 to the ski lift. From here a field path leads back to the hotel.